A firefighter has completed 20 marathons in one year as an emotional tribute to his late wife – and raised more than £10,000 for charity. 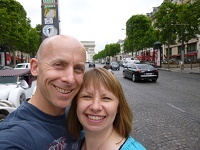 Steve Holder, from Hampshire Fire and Rescue Service, ran marathons across the UK as well as France, US and Norway – one for every year he and his wife Sharon were married. The 44-year-old Havant firefighter raised money for The Fire Fighters Charity, The Loss Foundation and Cancer Research UK. His adventure included a midnight run, a double marathon and a rock ‘n’ roll themed event, and covered more than 500 miles. Steve, also known as Noddy, said: “I had the idea to create a memorial and fundraising year. I wanted to raise money for charity, I needed Sharon to be remembered and I needed to run. “Running was helping, we’d been married for twenty years - it almost made sense. “To be honest the runs were more emotionally challenging then physically and sometimes I would be at the start line wondering what I was doing there. “I knew I wanted to complete the challenge for Sharon and I am glad I have. I will run other marathons but not this many in one year again – I want this achievement to be special. Sharon died in February, 2015 after a long battle with breast cancer. Steve went on to say while some planned marathons had been cancelled and replaced with others he also wanted to finish the challenge where he and his wife were born and grew up. It had started with the Enigma Winter marathon in Milton Keynes on January 3 last year - where he achieved his fastest time of 3hrs 26 - and ended with the Portsmouth Coastal Waterside marathon on December 18 with a time of 3hrs 29. Steve added the final marathon saw friends and fellow firefighters coming out in force to cheer him on. He hopes to raise even more money as people continue to go to his Virgin Money Giving fundraising page.